Live music every weekend at Sparkman Wharf - powered by Gasparilla Music Festival! It’s official! We will be dropping confetti all over Sparkman Wharf for our 5th Annual Noon Year’s Eve presented by Florida Prepaid College Plans. Join The Mommy Spot Tampa Bay for this special private event to ring in the NOON year with your family! 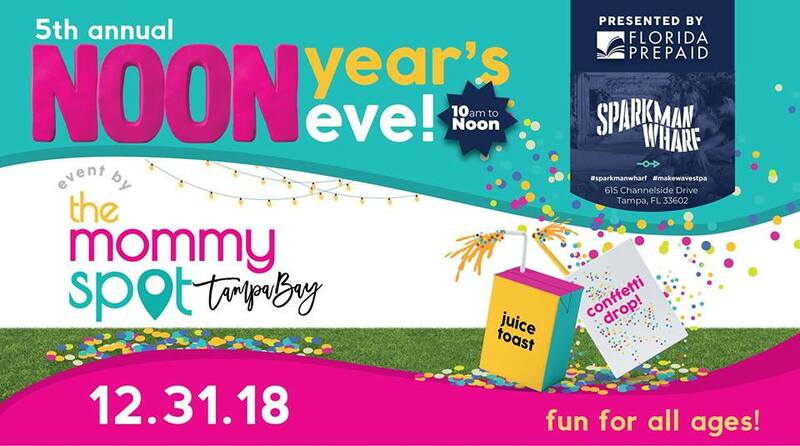 Dance the morning away with special musical guests kid DJ Jake Dela Cruz and Mr. Tommy, a juice toast by Honest Tea Kids Juice, and a confetti launch powered by Sparkman Wharf to ring in the NOON year! This is one of our biggest events where Dads come too since it is fun for the entire family! This event is presented by Florida Prepaid College Plans , who has helped more than a million families save over the last 30 years. With their guaranteed Florida Prepaid College Plans and flexible Florida 529 Savings Plan, you can secure a debt-free future for your child. Sparkman Wharf, Tampa’s newest outdoor waterfront destination is partnering with us to host this fun event on their event lawn, adjacent to many food options and their Fermented Reality Biergarten. Our Noon Year's Eve Celebration will benefit our local Babycycle Diaper Bank! We will be collecting goods to restock their shelves with training diapers/pull-up and hygiene items as they have been the main diaper bank in Florida to facilitate in relief for hurricane victims in Panama City. There will be a juice toast at noon brought to you by Honest Tea! They will be providing delicious Honest Kids juice for the kids for right after the exciting confetti canons! There will also be Honest Teas for the adults to sip on during the event. Included in your ticket is admission to the event, fun snacks, a juice toast, lots of family fun, and new this year, a gift bag for the first 150 families that arrive, the perfect "New Year's Eve Kit" to take home from some of our amazing partners! You'll find goodies from Bitsy's, Sneakz Organic, GoGo squeeZ, Honest Tea, Meri Meri, and many more to come!! It isn't a Mommy Spot event without the swag!! Stay tuned for more details too on the fun activities to come! Tickets are now on sale so don't wait to snag yours!! Children ONE and under are FREE and do not need a ticket.